Looking up at the Warra Flux Tower. Several of the AP200 intakes can be seen. The CPEC200 is mounted at the top. The Warra LTER site includes a flux tower that is part of the OzFlux Network (www.ozflux.org.au) and the Australian Supersites Network. The flux tower consists of an 80-meter (262-foot) guyed steel-lattice tower. Turbulent fluxes of heat, water vapor, and carbon dioxide are measured at the top of the tower using a Campbell Scientific CPEC200 Closed-Path Eddy-Covariance System with a vortex sample intake. A combination of a Campbell Scientific AP200 profile system with eight intakes and a series of Apogee aspirated temperature sensors provides a vertical profile of water vapor, carbon dioxide, and temperature. The profiles are used to calculate the change in storage (i.e., accumulation or depletion) of the two gases and heat. The change in storage is added to the turbulent fluxes to determine a total flux or net ecosystem exchange for each scalar. 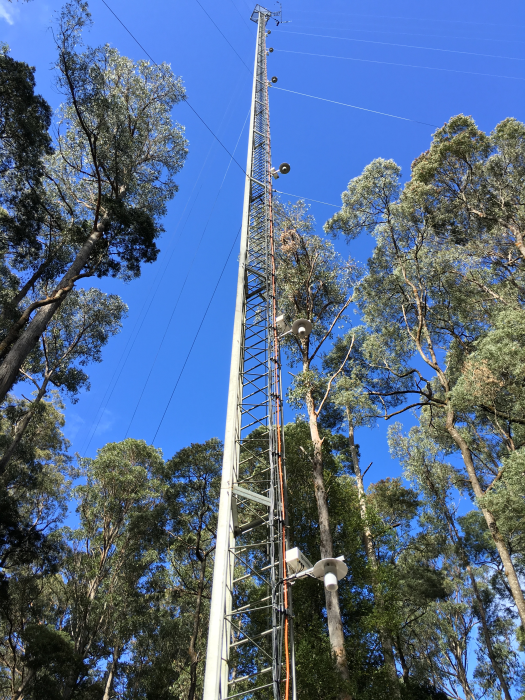 A profile system is particularly useful at a site like Warra where the change in storage is significant in times of lower turbulence intensity (e.g., at night) and within the especially large forest canopy. Supplementary measurements are also made above the canopy with Campbell Scientific instruments, including temperature and humidity, wind speed and direction, rainfall, incoming and reflected shortwave radiation, and net radiation. At ground level, soil moisture content is measured using time-domain reflectometry (TDR) instruments, while soil heat fluxes and soil temperature are also measured. Since the Warra LTER site was established, more than 200 research projects have been undertaken at the site, and ten of those projects have been designated icon projects, designed with the specific intent of continuing remeasurement in the long term (more than 15 years). The Warra flux tower is one of these ten icon projects. Note: TERN Australia has posted a video about this project on Vimeo: https://vimeo.com/260745357.